It’s been a long time since I updated here: sorry! I am crossposting an entry from my live journal, with a short addition. It’s the clip above, in which a basically honest bartender gets involved with some very shady people out of greed. Now to the blog post. A couple of weeks ago, my sister and I had the pleasure of going to the Simmons/Horn book Symposium. The theme was resistance, so it was timely, to say the least. I got to meet Richard Peck again! And he was on a panel with the winner for YA literature, Angie Thomas, author of The Hate U Give. This is a book you need to read carefully, without skimming or skipping around. When I first began reading it, I was doing both those things. And it seemed too polemical, too much a retelling of current events. When I read more slowly, though, I really appreciated the story, the characters, and the craft Thomas uses in bringing them into a whole. It’s pretty devastating, actually, but not without hope. Since she is a woman of color, Thomas is able to do some things a white writer could not. She presents her African-American teen characters with great empathy and nuance. The boy who dies in the story, Khalil, is by no means a bad kid. But he does make mistakes. He gets involved in gang activity, though he doesn’t want to and avoids becoming a gang member. When the police pull him over, he argues and is slow to cooperate. it’s nevertheless quite clear that Khalil and his friend Starr, the main character, are unarmed children who pose no threat to anyone. Khalil dies, anyway. That’s not a spoiler, since it’s been one of the selling points of the book that the main character witnesses a police shooting. What follows might be. I hope every adult who discusses this book with teens will ask why. Why are our police being taught to treat civilians as the enemy? Why are they going abroad to learn crowd control techniques from occupying armies? 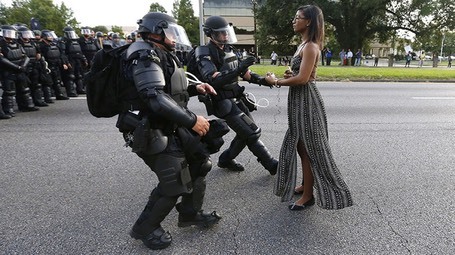 Why are they using military riot gear? Aren’t the police our fellow citizens? Some might be tempted to answer: because those minorities are violent and dangerous. So the police are scared. If that’s your answer, please rethink it. Who is being violent in the picture above? The violence police are carrying out against civilians is criminal, to my mind. Whenever theres a crime, in classic detective novels, the detective always asks one particular question. Cui Bono? Who benefits? It seems to me that what president Eisenhower feared has come to pass. We are living in a state of perpetual war; both war abroad and war against our own citizens. The arms makers and arms dealers make millions by selling weapons to the police. It’s to their benefit to keep doing so. The more they can make civilians seem like ‘the enemy”, the more weapons they can sell. the more the police lose sight of their actual mission; the more they see themselves as soldiers in an undeclared war, the happier the death merchants will be. We are walking over a cliff, and it really seems to me that most of us don’t see it. Oh, we see the effects. The tanks rolling through working-class neighborhoods, the police in riot gear, the young men shot, the guns everywhere, on all sides. We see the racism and ignorance—great evils, both, to be sure. But we don’t see the greed. If we could deal with that directly; if we could stop the arms merchants in their tracks, we would be far better off. Oh, the ignorance and racism would still have to be fought. Always, and hard. But we would not have to mourn so many deaths. We would have a chance to look at each other and talk to each other, and maybe the fears would lessen. So let’s, please, try to deal with this structural evil. Let’s halt the merchants of death. We must, at the same time, try to deal with other structural evils, especially racism and poverty. But let’s tackle the arms merchants first. They are in charge of our world right now. They have taken the White House and have a stooge installed there. If we can stop them, we can start to make our country, and our world, a better, safer, and more loving place for all the Starrs and all the Khalils out there. Please. Let’s do it.